Dan anchored Nightline this past Friday in an episode that discussed numerous topics including all of the hidden travel fees and tips on how to avoid them, the JFK generation and how they are still affected today and finally robot penguin spy cameras. Reports Dan, “Tonight on Nightline, travel confidential, packing to go home for the holidays? Think you got a good deal on that flight? Not so fast. The airline industry makes a staggering 27 billion dollars a year off additional fees, from your bag to your WiFi and now those add-ons could cost you more than ever. We’ve got your survival guide. JFK generation, they weren’t even born when it happened, but for these millennials, the assassination of John F. Kennedy, wasn’t just a national tragedy, it was personal. 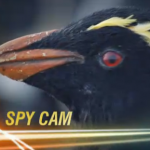 Spy cam – we’re undercover on planet penguin – it’s a high tech infiltration and for these robots, the eyes are the windows to more than just the soul, they’re giving us a birds-eye-view to the romance, the dramas and all the all out waddle wars.” Watch the full episode here.